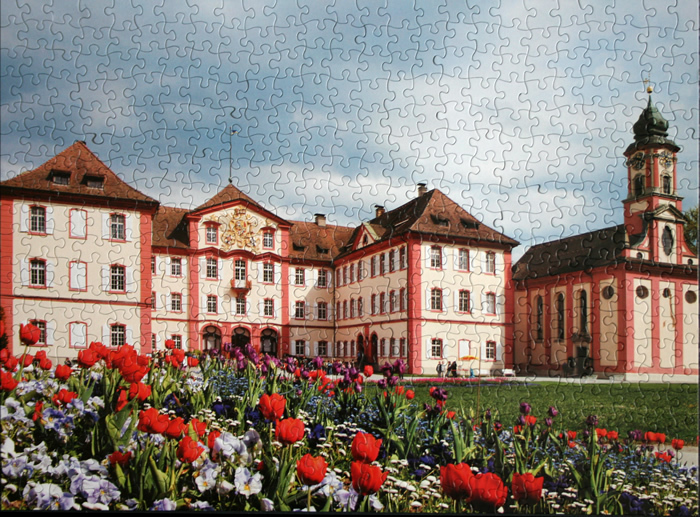 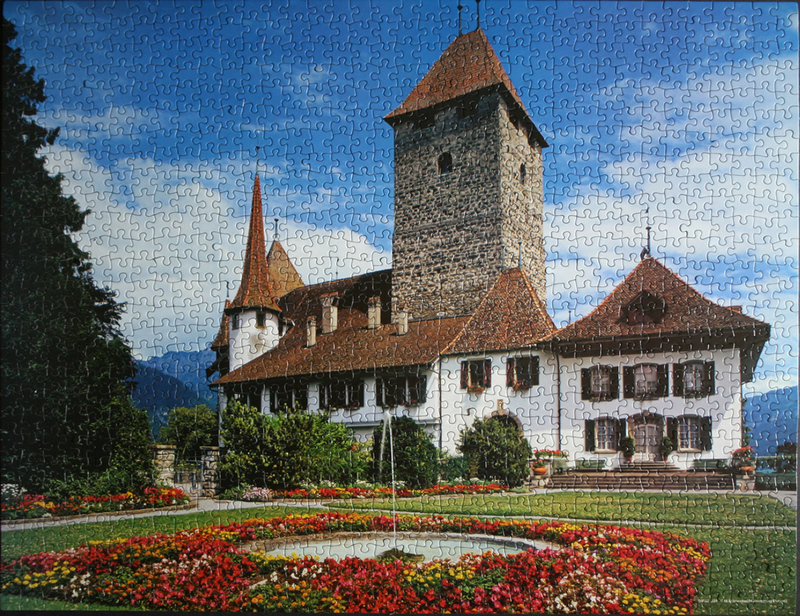 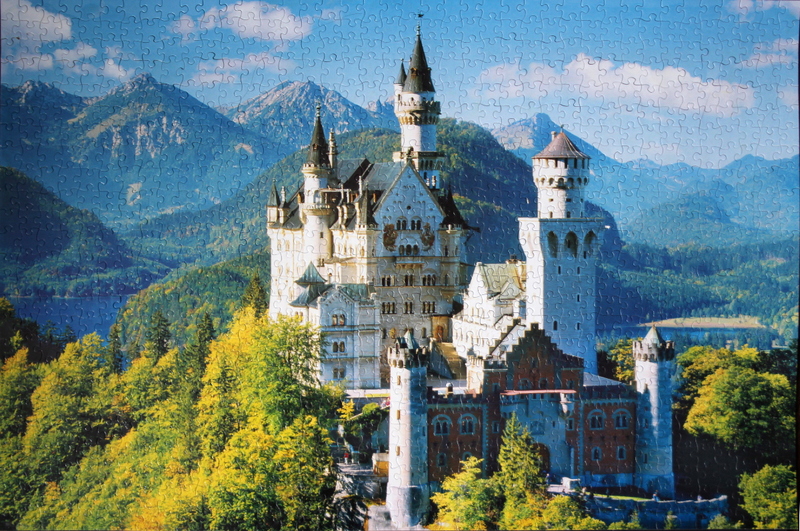 Puzzle: This lovely castle and the old buildings around it make for a challenging puzzle. 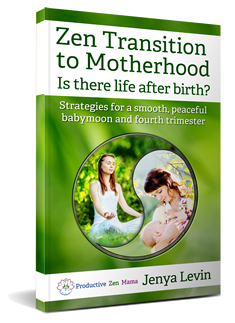 There are many ways to approach it. 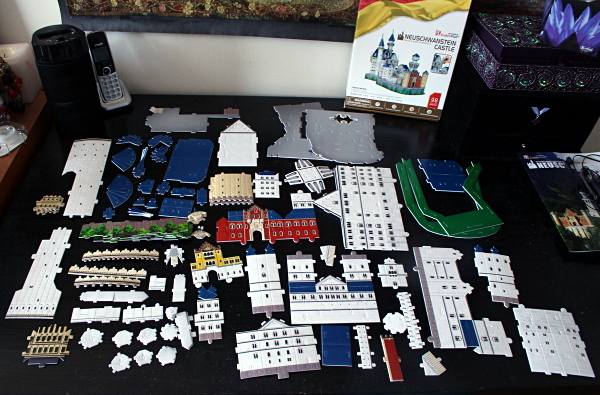 The easiest regions to start would be the sky and clouds, the bright cars and storefronts at the bottom, the green grass region and the fence at its bottom, and the borders of the buildings and the sky. 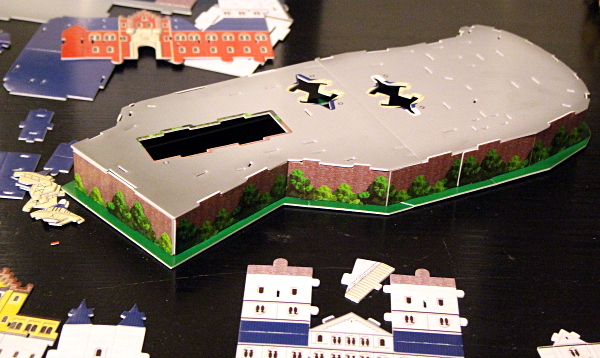 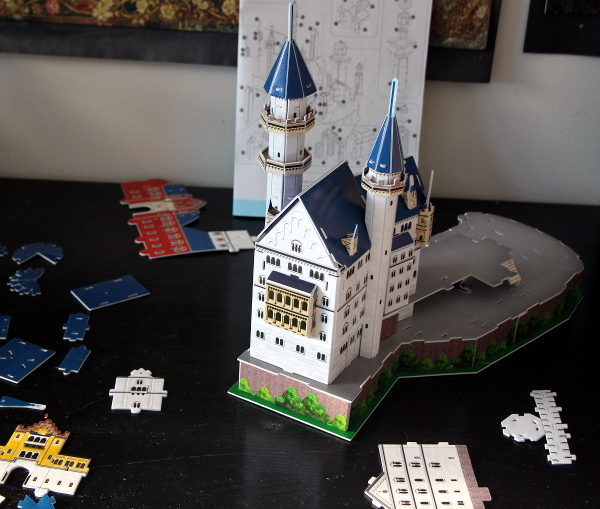 The larger windows of the building on the right can help the assembly of that part of the puzzle. 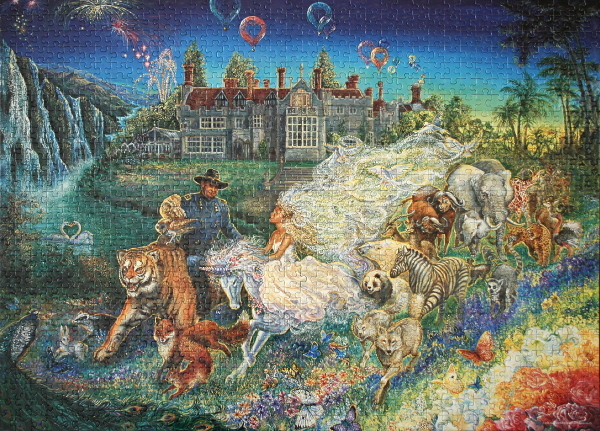 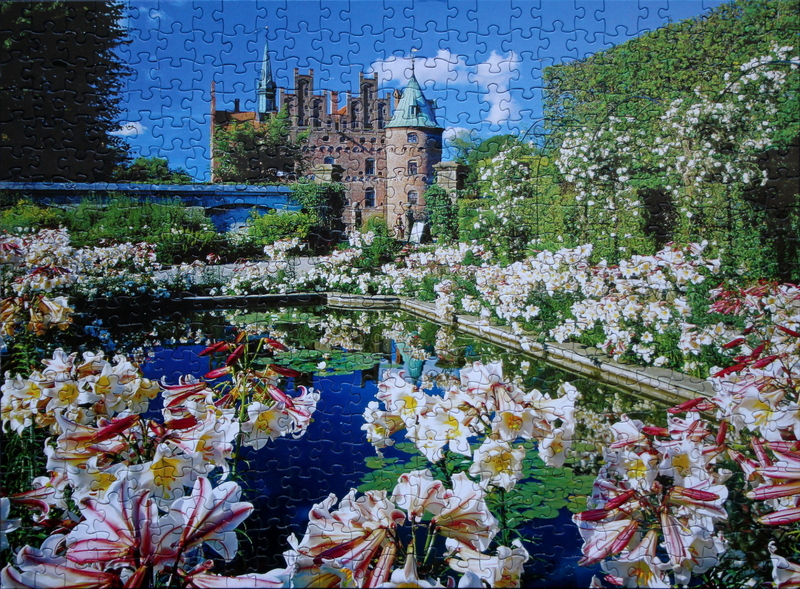 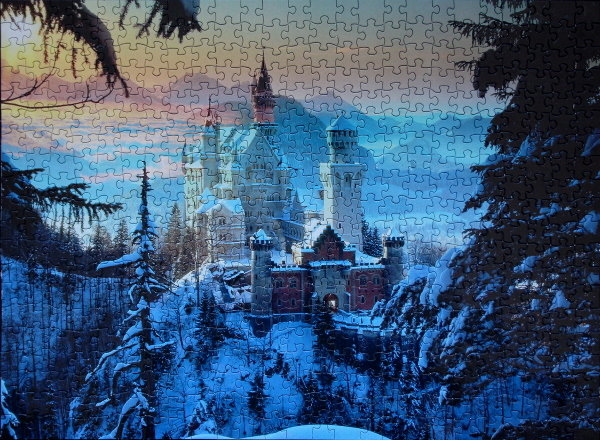 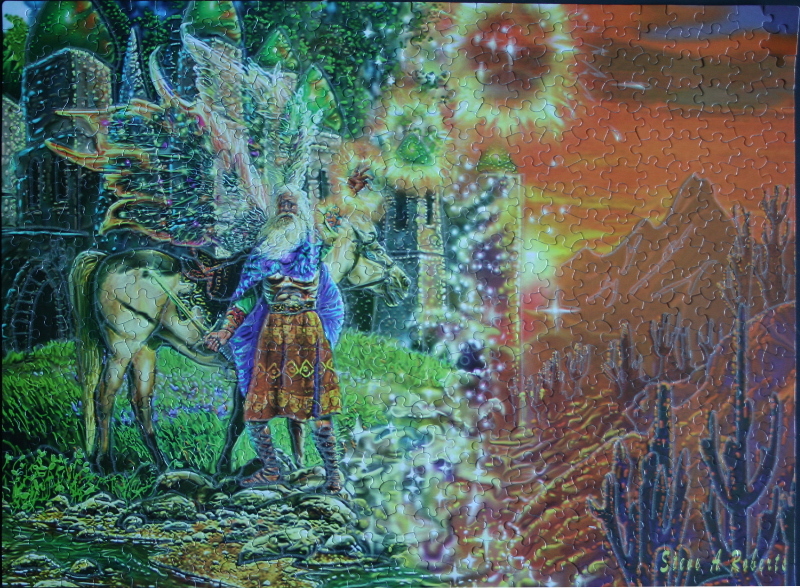 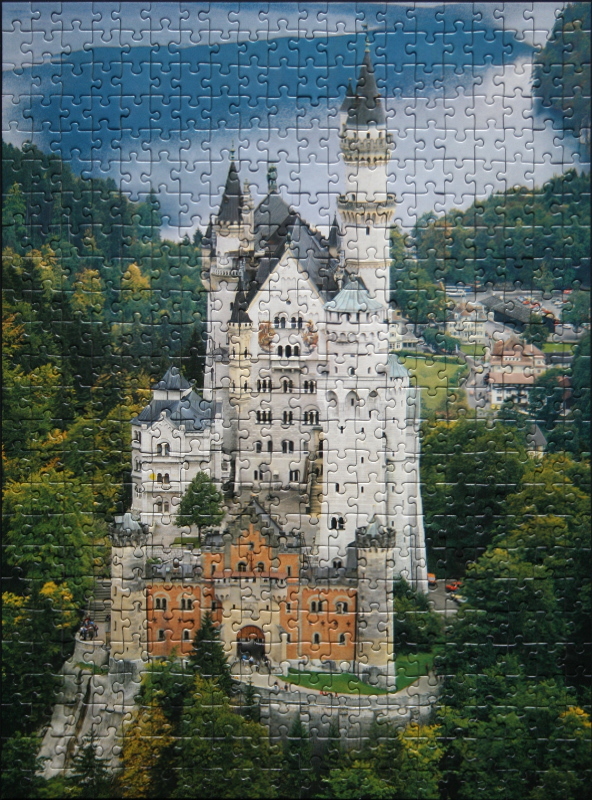 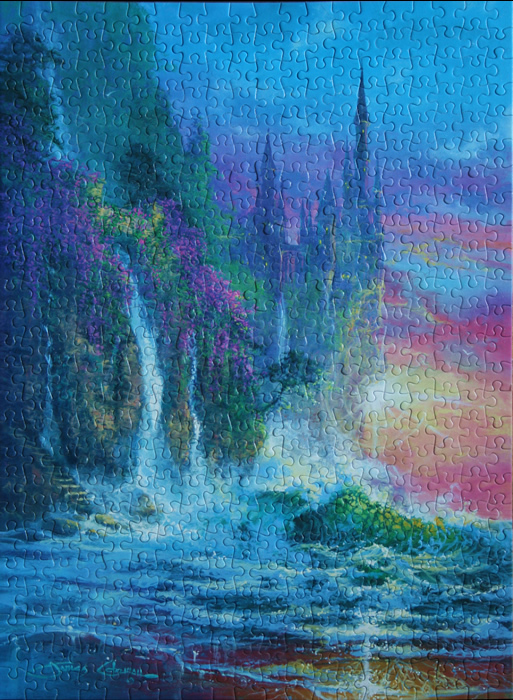 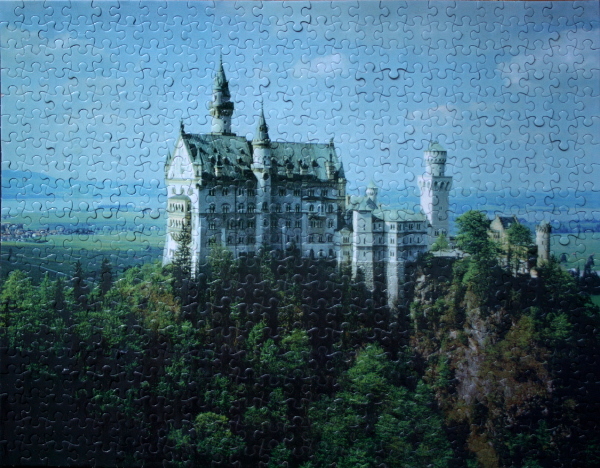 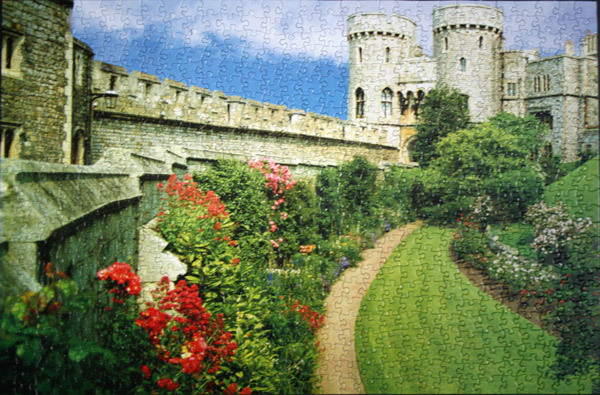 The sky and clouds are distinct enough from the rest of the puzzle and can be filled in relatively easily. The Trees and shrubs can follow. 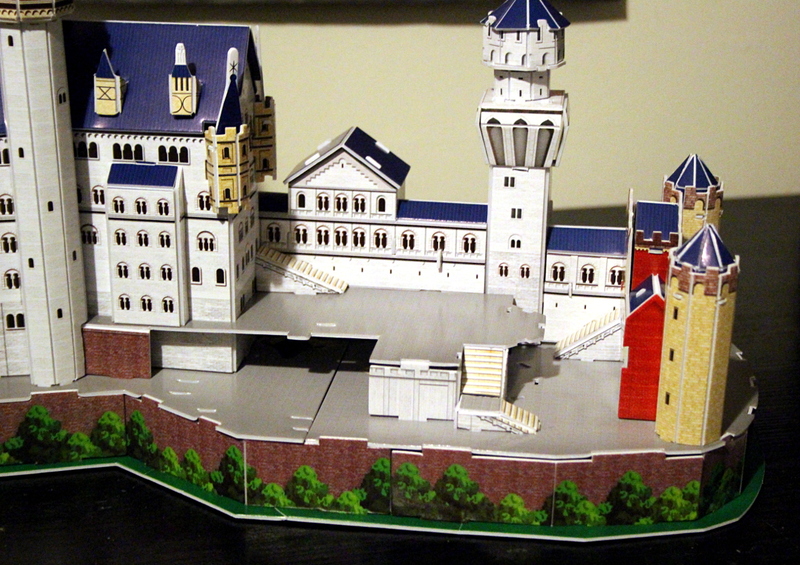 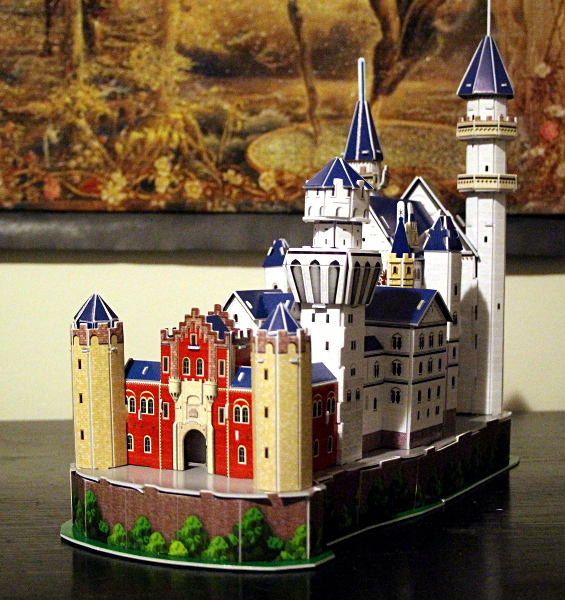 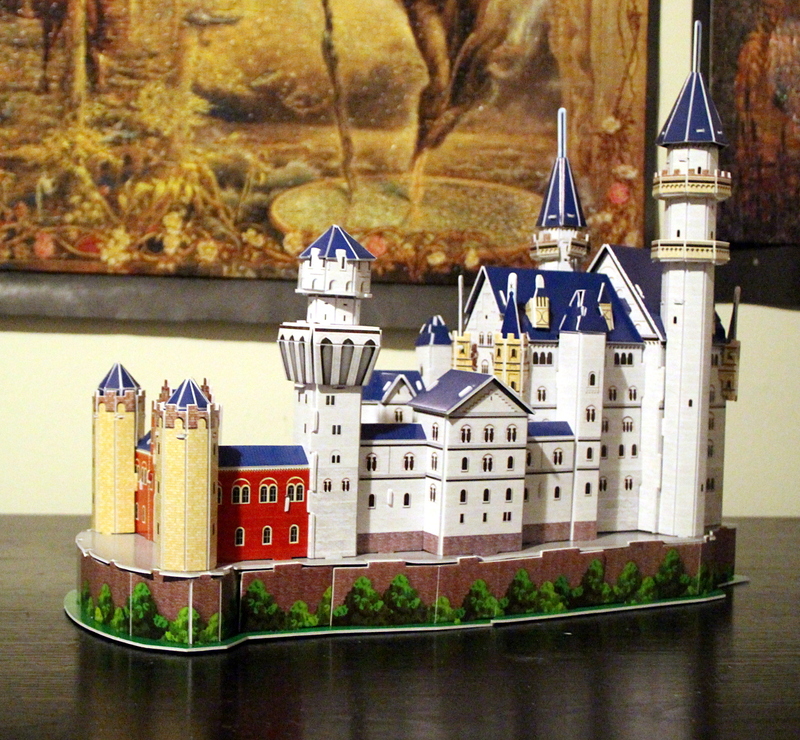 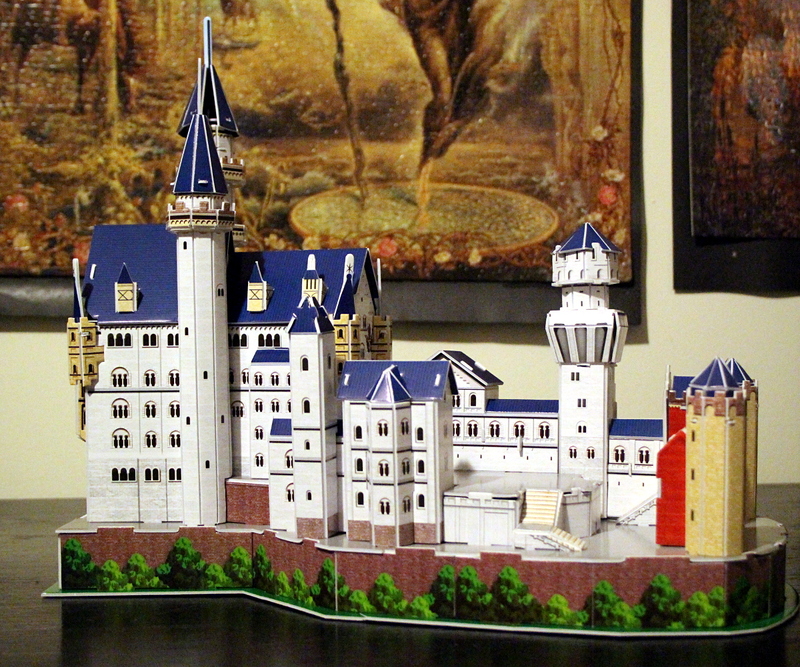 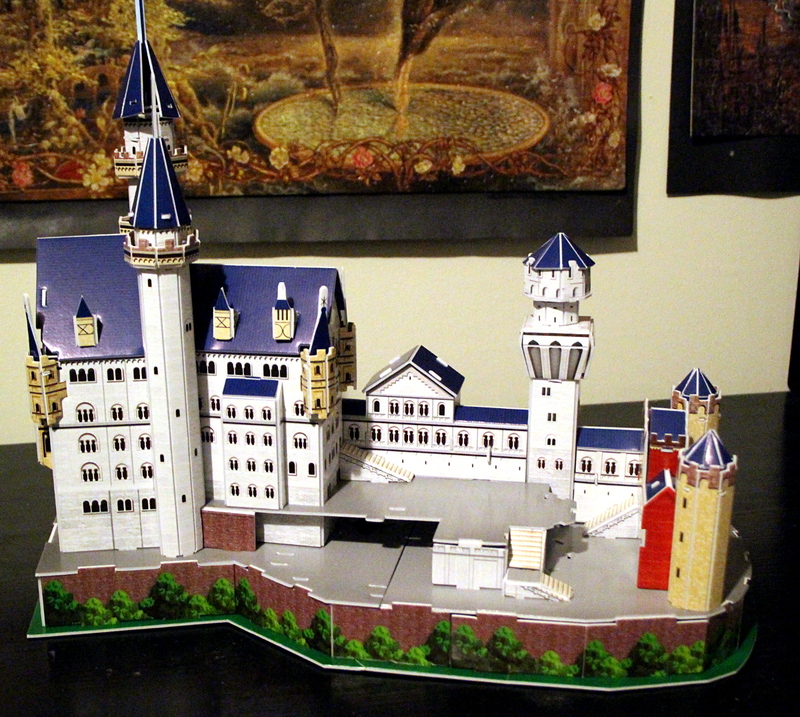 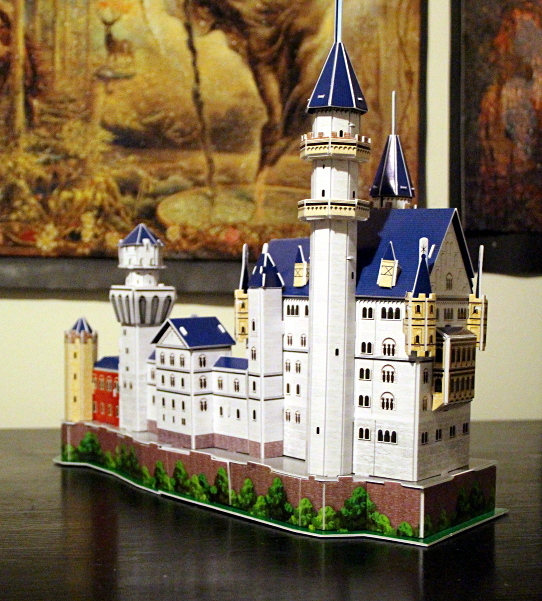 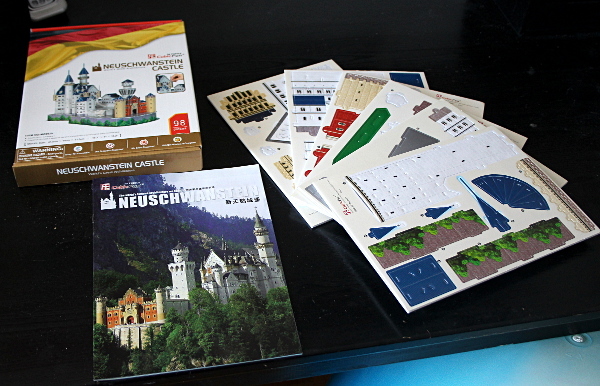 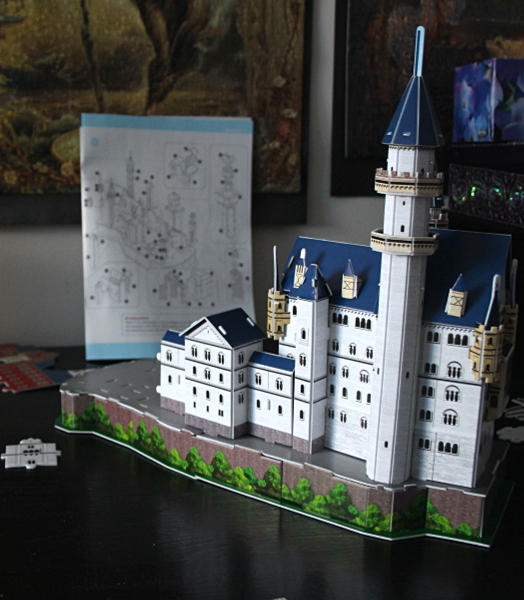 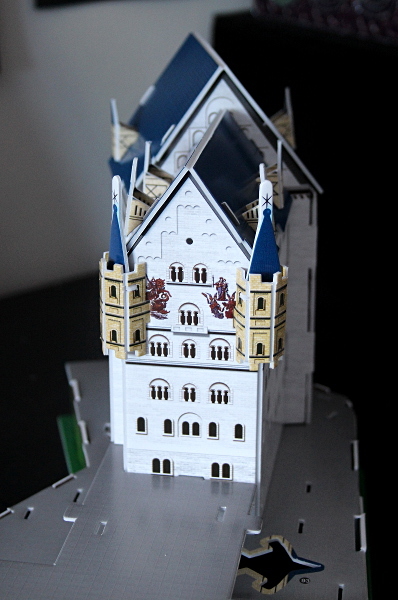 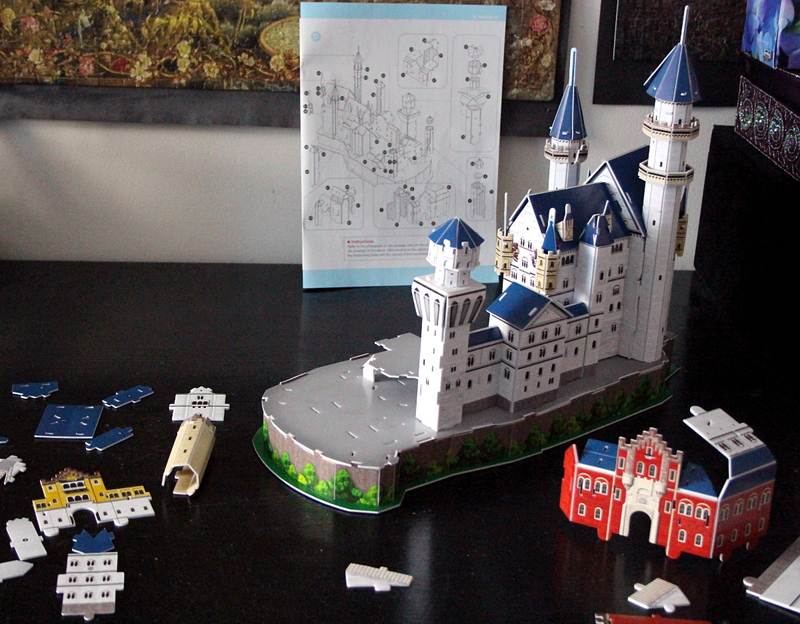 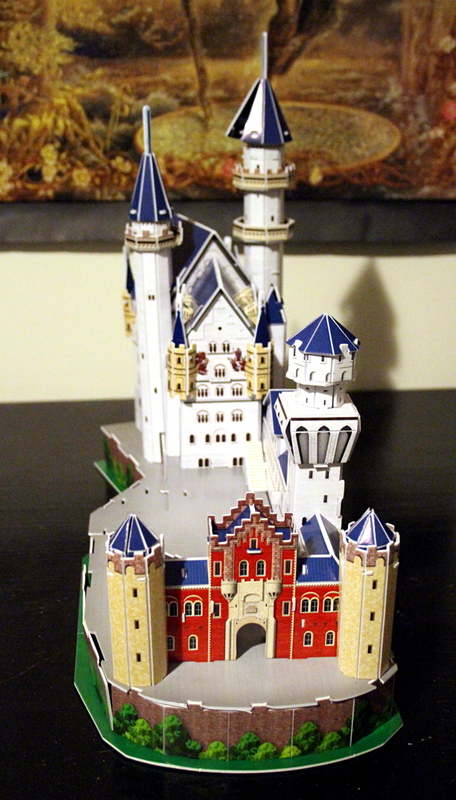 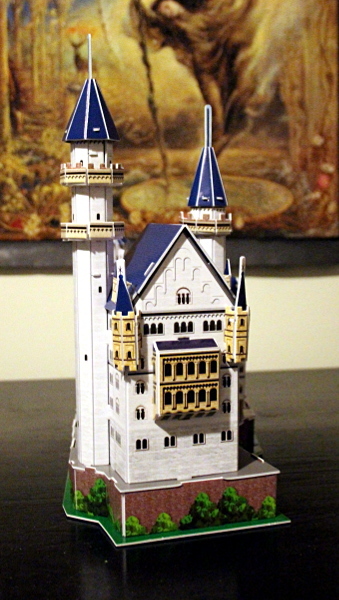 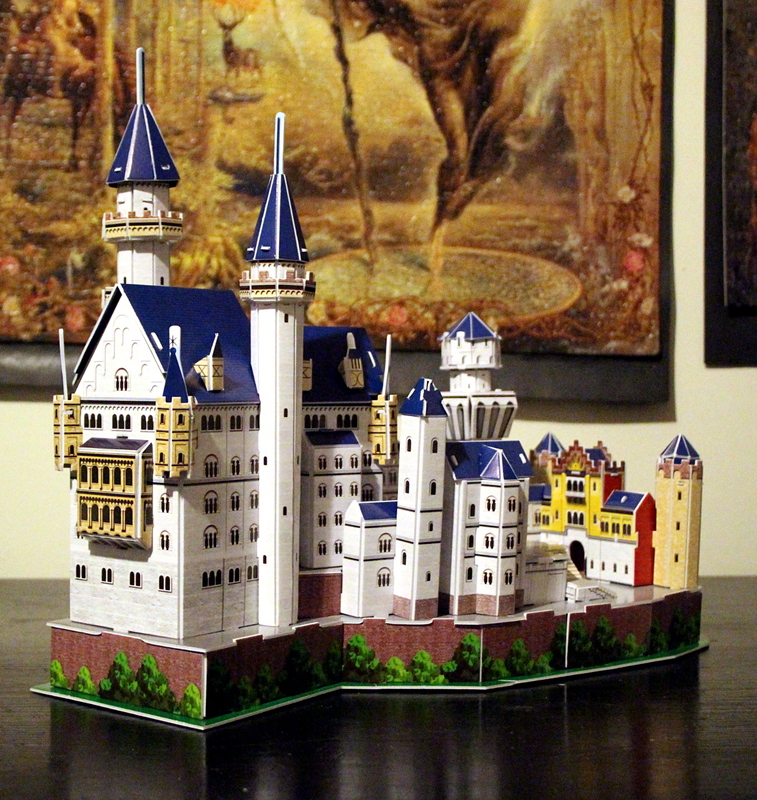 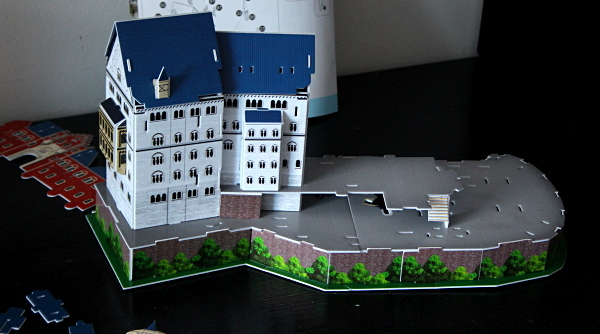 The castle has a large region of a somewhat-uniform grey pattern, making it not so easy to assemble, but it makes for an interesting challenge. 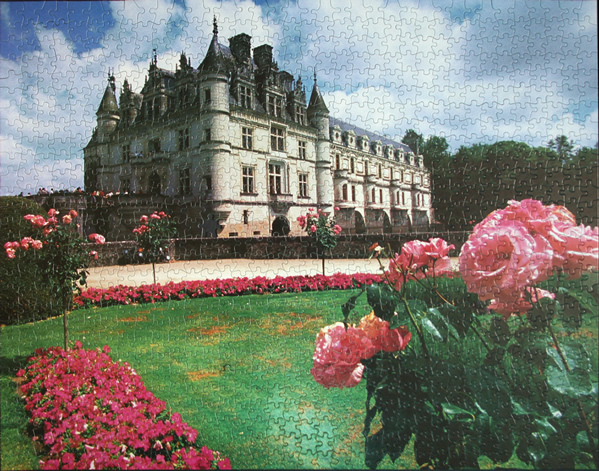 Notes: I no longer have the box, so if you know of the series this puzzle is from and the building it portrays, please let me know. 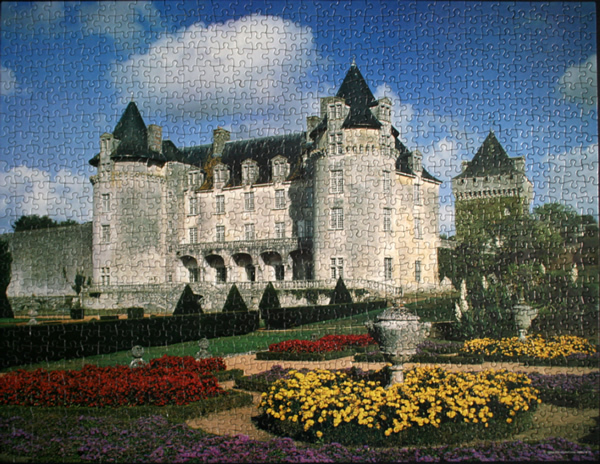 Notes: The Chateau de Chenonceau is a manor house near the small village of Chenonceaux, in the Indre-et-Loire departement of the Loire Valley in France. 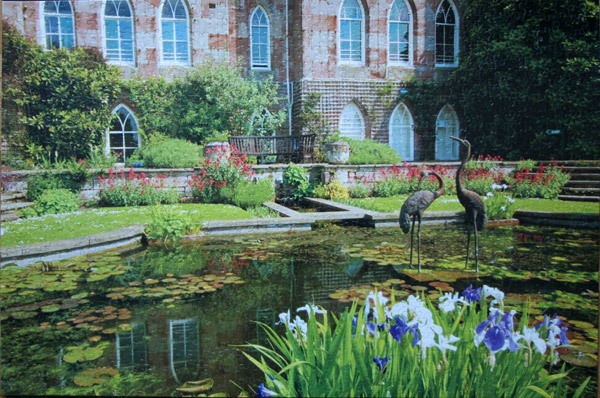 It was built on the site of an old mill on the River Cher, sometime before its first mention in writing in the 11th century. The current manor was designed by the French Renaissance architect Philibert Delorme. 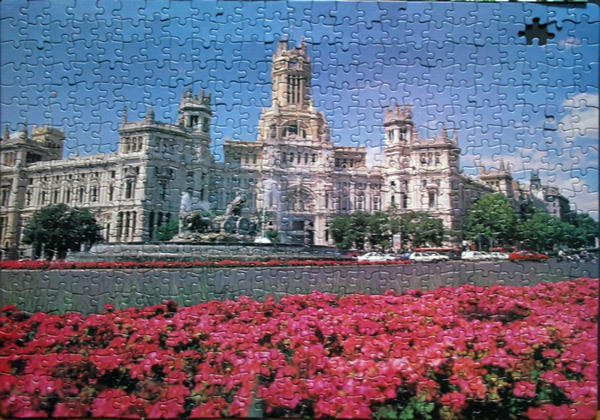 Notes: The Plaza de Cibeles is a square with a neo-classical complex of marble sculptures with fountains that has become an iconic symbol for the city of Madrid. 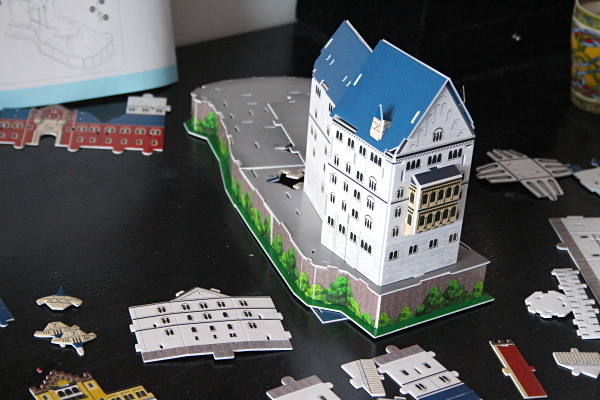 It sits at the intersection of Calle de Alcala (running from east to west), Paseo de Recoletos (to the North) and Paseo del Prado (to the south). Plaza de Cibeles was originally named Plaza de Madrid, but in 1900, the City Council named it Plaza de Castelar, which was eventually replaced by its current name. 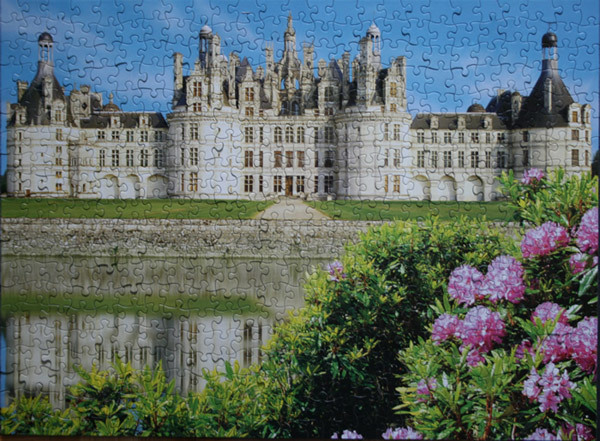 Notes: I have previously put together another puzzle of Chamboard Château, 1000: http://fingeringzen.com/puzzles/puzzle-chambord-chateau. Notes: Thanks to JLuecking’s comment below, I now know that this castle is the Castle of the Teutonic Order, and it is located on the Mainau Island, Lake Constance (Bodensee). Notes: I brought this puzzle with me from Ireland in 2008. 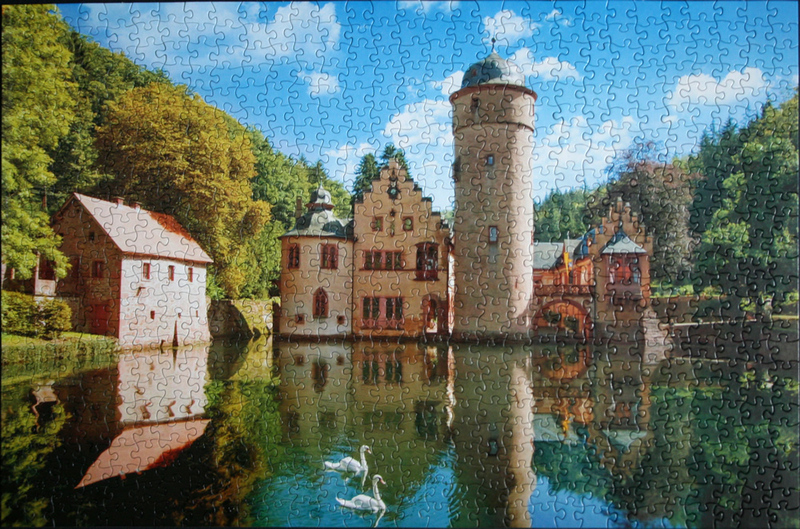 I do not have a record of the producer of the puzzle as I do not have the box anymore. A clarification is welcome – if you have any clue as to the details regarding this puzzle, I would much appreciate that information. 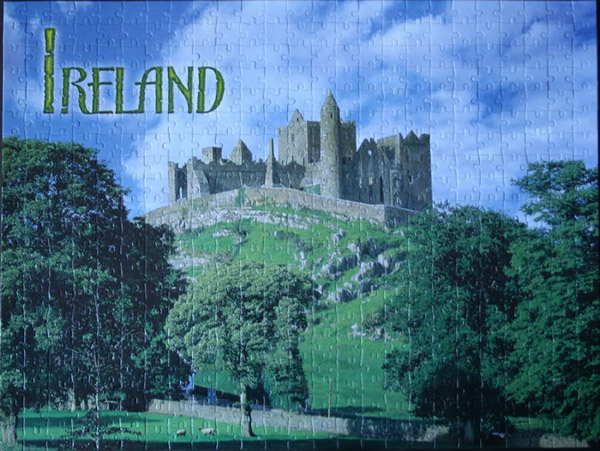 The Rock of Cashel (Irish: Carraig Phádraig), also known as Cashel of the Kings and St. Patrick’s Rock, is a historic site in Ireland’s province of Munster, located at Cashel, South Tipperary. 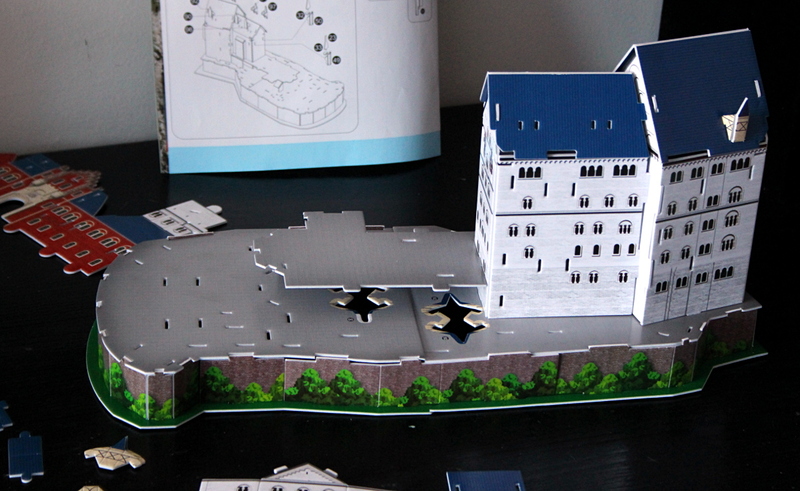 The Rock of Cashel was the traditional seat of the kings of Munster for several hundred years prior to the Norman invasion. Few remnants of the early structures survive; the majority of buildings on the current site date from the 12th and 13th centuries. 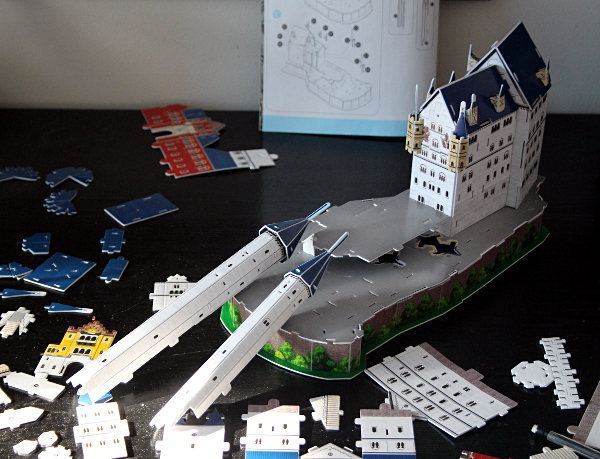 Cashel is reputed to be the site of the conversion of the King of Munster by St. Patrick in the 5th century. 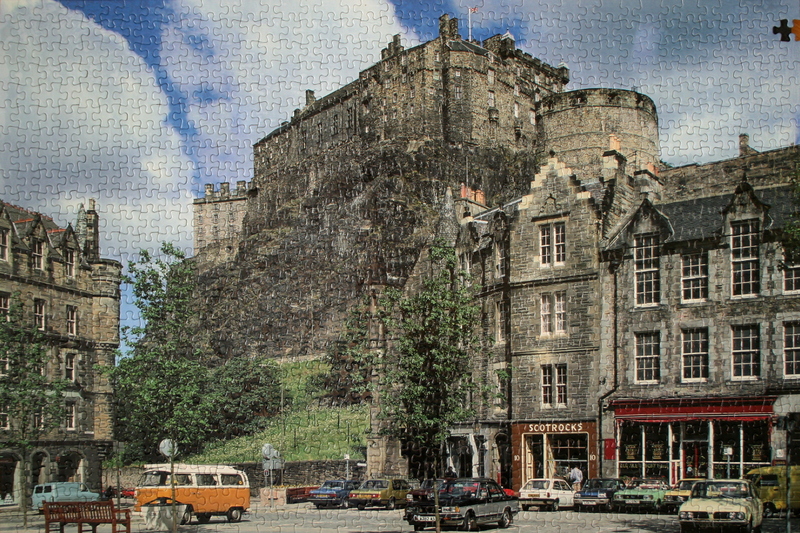 The picturesque complex has a character of its own and is one of the most remarkable collections of Celtic art and medieval architecture to be found anywhere in Europe.